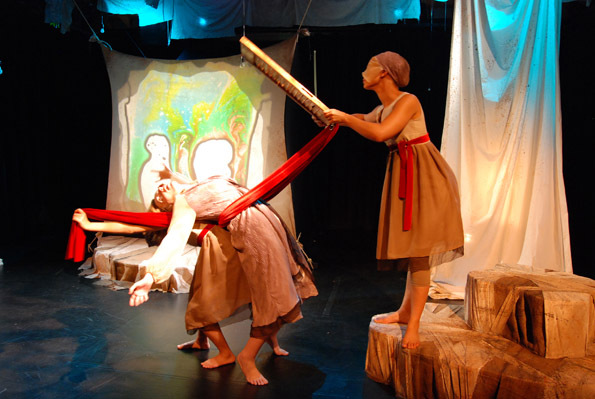 Since 2001 Tri-Pi has been dedicated to producing provocative live theatre that breaks down perceived barriers of race, gender, and disability, for all Los Angeles audiences and artists. We only produce in wheelchair accessible venues and provide open captioning for the hearing impaired at all mainstage performances. Stay tuned for more performances and events upcoming! Have a wonderful holiday season! En La Noche depicts one woman's harrowing journey up a raging river to save her dying husband and ponders the intrisic value of heroic deeds after circumstances have changed. If you are interested in booking this 45 min bilingual program which includes an introduction to Horacio Quiroga, the 15 min puppet show, and a Q&A demonstration, please contact us! TRI-PI was thrilled to present this new original work about the world of the Paris art circle and Amadeo Modigliani's gifted yet overshadowed wife, Jeanne Hebuterne, who leaped from a fifth floor window at the age of 21, a day after Modi's death. We wish to thank everyone at Highways and the wonderful cast and crew that made this piece such a rousing success! Please click here for a highlights video of the show! The Skirball Cultural Center commissioned Leslie to create a centerpiece puppet show for their annual Festival of Lights. "Living Lights, a shadow show about Hanukkah" tells the story of Hanukkah through shadows and music completely through visual images. For video of this remarkable original show, please click here! Tri-Pi, LA Audubon, and California State Parks worked together to produce the Second Annual Baldwin Hills Fest on Saturday June 18, 2011 from 10am-3pm. This year's event included two giant snail puppets and a California King Snake puppet manipulated by 7 people! The Kids' Crafts Area, sponsored by Folk Art Everywhere, a project of the Craft and Folk Art Museum, made windsocks out of recycles materials, and the LA Puppet Guild gave kids a chance to make puppet butterflies. It was indeed a wonderful day in the park! Sadly, this will be the last Baldwin Hills Fest that Tri-Pi administrates for the Overlook. Many thanks to all who participated! Please click here to view the HD video of BHFest 2010 parade highlights. PINK DRESS SHOW FINISHING 4th TOURING SEASON BEGUN! We just finished our last show of the season touring THE PINK DRESS. 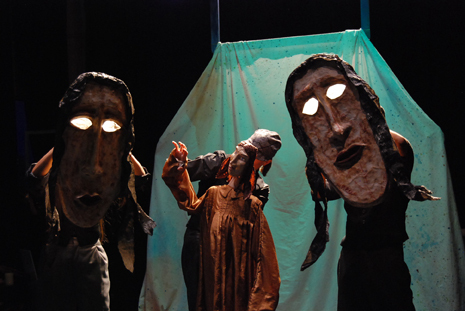 If you would like more information on booking this puppet production about the Japanese American Internment, please click here. Please check out our YouTube video of "DOES HE KNOW?" our March 2009 full scale production.